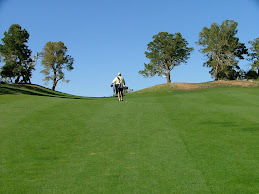 There comes a time in every golfer's life when he or she must take the gamble, try to pull off the shot of a lifetime. You know, hit the high cut shot around the pond trying to get the ball close to a back right hole location. Golfers are instinctively gamblers in one sense or another. With that in mind the staff here at Eye On Golf, the leader in truly meaningful golf advice has compiled a few thoughts (and odds) on the PGA Championship which begins today. Just in case you're still suffering from Tiger overload, the tournament in being played at Hazeltine National Golf Club in Chaska, MN. The PGA was fortunate to schedule the tournament here at this time, the only week of summer in grand ol' Minnesota. Tiger Woods 2-1: Even though this is his third event in a row going for his third win in a row, how do you wager against this guy? And you know he'll be somewhere on the leaderboard come Sunday afternoon. Stewart Cink 5-1: Now he knows how to win a major AND how to Twitter. What would be more exciting than Cink and Tiger in a playoff for the championship? Phil Mickelson 10-1: Not sure Phil is totally focused on his golf. (Would you be?) But ya never know. Steve Stricker – Sergio Garcia – Lee Westwood 15-1: Come on guys, it's about time for one of you three to man-up and win a major. The Field 75-1: Yes, there's a really good chance for another first time major championship winner. We've already had two this year and would have had three save that an Augusta pine was leaning the wrong way. Look through the list and make your choice except for the following. Kenny Perry 12-1: We were going to put him with Stricker and the boys, but after that Masters heartbreak we wanted to give Kenny a break. Paul Goydos 20-1: You may not know it but Goydos has been playing pretty well this year. He's had experience at the highest level and he's a damned nice guy. If picking the winner of a golf tourament wasn't so difficult, any of these would be a sure bet.